Mom Walked Up the Driveway Today! Those of you who have both seen our driveway and seen Mom at the worst part of her health crisis during the past year can attest that this is a remarkable sign of God's renewing touch on her body. Of course, all physical healings here on earth are only temporary: we have to die some day. But "temporary" healings like this are reminders that Jesus offers permanent healing as well: the miraculous act of bringing a soul that is in rebellion against God, dead in its sins, to life and eternal fellowship and joy with God in His presence (see Ephesians 2:1-10) . May this morning's video encourage you to worship Jesus and trust Him with your life! Why Don't You Like My Favorite Song? In my last two blog posts on music, I demonstrated that music, like all aesthetics, has an objective meaning. Why then do different people sometimes react to the same piece of music differently? Essentially because our interpretation of music's objective meaning can be subjectively changed. Sort of like the way cataracts affect our eyesight. The world itself does not change color but the way our eyes see it does. There are two main ways our perception of music is altered from its "objective" meaning. The first is through experiences that become associated with a particular piece or style of music. As an extreme example, check out the following two videos. The first video is "Glorious Things of Thee Are Spoken", a song rejoicing in God's goodness to the people He redeems from the curse of sin. This one? Well, you're in for a surprise! Yes, that's right! The same tune put to two very different purposes. This tune has been used as the German anthem both before and after Hitler, so it is not an exclusively Nazi song. However, my point is that if you were to play the Christian hymn "Glorious Things" to this tune in some regions of the world even today, it would conjure up memories of Nazi occupation. For example, I wouldn't suggest using this hymn in Israel! So, the subjective meaning of the music can be different to different people. To me, the tune turns my mind to worship of God. But to others, the tune might awaken terror or anger or nationalistic pride. But that doesn't mean that there is no objective meaning to this tune. Musical meaning is not simply the combination of our individual experiences. There is always an objective meaning as well, a starting point from which our subjective experiences shape our own perception of it. The very fact that this tune was picked both by the Germans to carry their anthem and by Christians to carry their worship hints at its objective meaning. This tune unquestionably conveys majesty and glory. It is a good tune to use for worshiping. The only question is who or what is the object of the worship. But does experience alone account for the differences in musical taste that exist among us? I think not. There is another more fundamental reason, and that is what I will discuss in my next post about music. 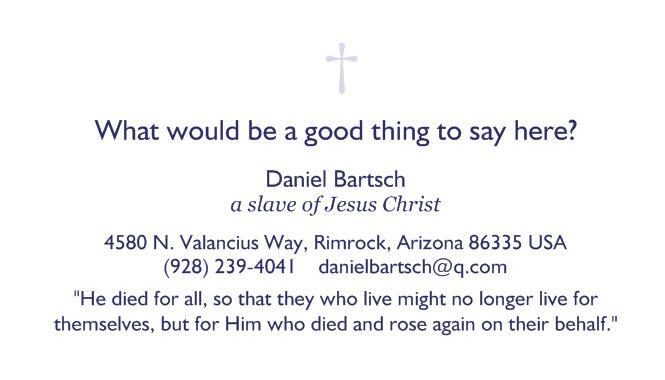 Help Me Design My Evangelism "Business Card"! As you can see, I'm having trouble deciding what to fill the blanks with. 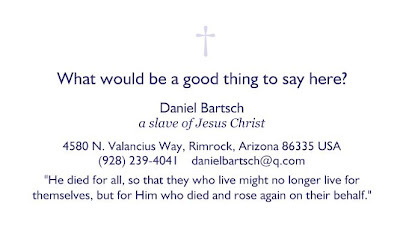 The contact information of course will stay the same, but I still have the top line with large letters, and the bottom two lines (which currently contain 2 Corinthians 5:15). I would be very grateful for your suggestions on what to put in these spaces. Note: if you're viewing this as an email or in a feed reader, you'll probably have to view this in my actual blog to be able to play the embedded audio samples. Sorry about that! Music, like all forms of art, always carries an objective meaning, or message. We discussed this in my first post a few days ago. But I missed a potential objection that is worth answering. Essentially, the argument goes like this: "Your examples included lyrics. The message of the music derives from the message of the lyrics." Even though I attempted to demonstrate that this was not the case (through the obvious ill-fit of swapping words between the two tunes), this does not fully answer this argument. It could be thought that the reason we think of Onward Christian Soldier's tune as marching and militaristic is because of the words that we've learned to associate with it. In other words, someone might say that if we were the first people to hear the tune after Arthur Sullivan composed it (before any words were ever sung to it), we would not naturally associate it with marching, armies, or any other particular mood or emotion. I can already hear someone objecting that the reason this sound makes us happy is not because of the melody itself but because of the food that is associated with this sound. I would argue that there is a reason that this particular sound was used to sell this food. It's not coincidence that the ice cream man doesn't use a police siren to attract business. But then someone could say that there is nothing particularly alarming about the sound of the police siren either, it's only the emergencies that we have come to associate with the siren that causes it to be alarming... sigh. For such an argument I have a possible answer: compare the mood of the following two sound clips. Neither of them has words. Neither is associated with any events (that I'm aware of). These sounds are both short and relatively simple, so the emotions they evoke will not be strong. But if lyricless music is by itself a meaningless combination of sound waves, either of these sounds should be equally attractive. But if music can have an inherent mood or emotion to it, then one of these sounds will be substantially more pleasant than the other. Not only does every piece of music carry an objective meaning, but the objective meaning it carries is initially the same for everyone. We see this 'uniform perception of beauty' in other forms of aesthetics as well. No one instinctively thinks a sunset is ugly, or that feces smell good. Generally we all react to music the same way. This is why movie producers can (and do) use music very effectively to aid the impact of their visual images. If the "scary music" didn't give us all pounding hearts and widened eyes and sweating palms even before we see the villain produce a hidden revolver--if the scary music made some people relaxed, and yet others feel romantic--music would be useless in movies. Producers of radio and television advertisements have also learned to use the universal meanings of music to produce the desired emotion in their potential buyers. I ended my last post by asking how music can be evil, and I will end this post by answering. We have the capabilities to feel not only legitimate and helpful emotions, but also unholy emotions. Music can stir up either kind of emotion. It can awaken awe and joy and worship, and it can also arouse lust and rage and rebellion. We should aim to honor Jesus by feasting on songs that both arouse righteous affections in our hearts. But, sometimes people react to the same piece of music differently! If music has objective meaning, why don't we all have the same musical tastes? That's the question I'll attempt to answer in my next post about music. Keep your comments coming! This evening our church finished a group study based on Ken Sande's book, the Peacemaker. It was excellent. Not just psychology with a few Bible verses thrown in, but real, solid application of Biblical truths to everyday conflict. You can read a lot of the key peacemaking concepts on their web site, but let me recap a few that have helped me. Conflict is an opportunity, not something to escape. Whether we "win" or "lose" a conflict, we can always use it to glorify God, serve our opponent, and grow to be more like Jesus. Peacemaking is a powerful form of evangelism! Christians ought to be characterized by radically different resolutions to conflict. The gospel is what makes peace possible. If Jesus had not taken the initiative to make forgiveness available to us through the cross, the just dying for the unjust, the victim bringing healing to the aggressor, we would have no fuel to do the same with people who wrong us. The video below demonstrates the way that many people try to make peace without Jesus. It's humorous. But it's also a bit sad, when you realize that this is really the way some people live, and these are the best peacemaking principles they know! Hippie Peace from Peacemaker Ministries on Vimeo. My pastor brought this book back from the Together for the Gospel (T4G) conference and I gobbled it up in less than 24 hours. I wouldn't mind being a history teacher in heaven. History is such a fascinating record of God's dealings with men! It's a quick but substantive summary of the history of the Reformation. This book was so encouraging to read! First, because as bad as things are in the world and in the church today, they have been worse. Second, because when the spark of the Reformation was kindled, God overturned centuries of darkness and error very quickly. Third, because Luther, Calvin, and Zwingli (and the other reformers) were all deeply flawed men but God used them to shake the earth. Fourth, because it shows just how precious and powerful the Bible is. The Reformation was essentially sparked by the publication of the Greek New Testament by Erasmus (even though, sadly, Erasmus himself was not converted!). It was soon translated into French, German, and English. These common-tongue translations resulted in the rising and falling of kings and nations. Fifth, it shows how precious and powerful the gospel is. It is powerful (as Romans 1:16 says) because the gospel is how God takes a sinner and makes him a saint. It turns a rebel into a worshipper. The gospel is the only real way that the hearts of men are changed. It is precious because it is easily lost. Even the Protestant reformers at times lapsed back into proclaiming moralism and works-righteousness. It seems easier up front to change people through law: but this only affects the outside. Only grace changes the heart. Sixth, it shows the dangerous power of culture. Luther's antisemitism and Calvin's prosecution of Servetus were culturally acceptable in their day. Their great victories came when they obeyed the Bible rather than culture. Their great failures came when they went along with the flow of culture. In another four centuries people will look back on our culture and wonder how we ever got so apathetic about abortion and lust and materialism. Seventh, it shows the fatal results of mingling religious authority with political authority. Lastly, it reminded me that the need for the reformation is not over. The Catholic church has improved on some peripheral issues (such as the use of languages besides Latin in Mass), but on the core of the gospel, they are still dead wrong. The difference between justification by faith and justification by faith alone is the difference between life and death. But it's not just the Catholic church. To paraphrase Solzhenitsyn, the line between good and evil does not run between Catholic and Protestant, but through every human heart. We all have the innate tendency to want to add something to the work of Jesus in order to have at least a small excuse for feeling good about ourselves. The book is well written, with concision, balance, and wit. If you enjoy history, you'll enjoy this book. As a teaser, you can listen to an interview with the author, Michael Reeves, by clicking here. It's been a while since I have written anything controversial here. The last big flap I caused was back in 2008 when I suggested pet ownership is often severely selfish. So now let me touch another topic that is surprisingly near to everyone's trigger: music! Music seems to speak directly to our passions and emotions, and is a sort of universal language. My own beliefs about music might seem antiquated or overly narrow. Nevertheless, over the next couple of weeks I will post a few articles explaining them as best I can. If they only prompt you to prayerfully ponder how your own auditory diet can best honor Jesus, my goal in publishing this will be accomplished. It is extremely hard to draw a definitive line. No line is given to us in Scripture, but that does not mean that a line does not exist. It simply means that God intends for us to live with some uncertainty about the exact location of the line. A similar situation exists with clothing. I think all Christians would agree that some forms of clothing are sinfully immodest, while other forms of clothing (such as the Islamic hijab) are legalistically conservative. God commands modesty (1 Timothy 2:9), and yet He did not give us an exact hemline measurement. Clothing is also similar to music in that it is a complex aesthetic. It’s not simply a matter of hemline. The “message” of the clothing is also affected by its color (black, white, red, pastel, vibrant), pattern (dress suit vs. T-shirt), fit (how it hangs on a particular person’s body), fabric (Mr. Roger’s sweater), age and condition, cost. The appropriateness of a piece of clothing depends partly on the setting in which the clothing will be worn (wedding, inauguration, bedclothes). And yet there are some clothes that are inappropriate in any setting. Similarly, music’s message is multidimensional, affected by the instrument(s), melody, tempo, rhythm, etc. Our ultimate focus should not be on the "line" at all, but on Jesus. A focus strictly on the "law" will only make us worse law-breakers (or benders!). Instead, let's focus on getting as close to Jesus as we can, by embracing the cross, repenting of our sins and trusting in Jesus alone as our Savior, Master, and Treasure. Some people believe that music itself has no message. A piece of music, they think, is like a blank sheet of paper, ready to carry the message (the lyrics) that are written on it. Music has no message of its own. Thus, music itself is morally neutral, neither good nor bad. The only thing that makes it good or bad is the lyrics attached to it. But these two songs demonstrate the fallacy of that reasoning. See if you notice any difference in the messages of their music. The lyrics for both hymns were written by the same author, Sabine Baring-Gold. He wrote them using an identical poetic meter, which means you can actually swap the words between tunes. To a person who believes music is messageless, it should make no difference to sing the words of "Onward Christian Soldiers" to the tune of "Now the Day is Over". The fact that this seems unfitting shows that we do instinctively know that music carries a message. But, you might be thinking: OK, yes, both pieces of music did carry a message, but neither piece of music was morally evil. It is just a matter of finding the music that best conveys the message of the words. There is no "bad" music, just "ill-fitting" music. This is the argument I'll rebut in my next post about music. Meanwhile let me know your own thoughts! Today Mom completed her sixty-third trip around the sun. Join Dad and I in rejoicing in God's goodness in leaving her with us for another year. I happened to notice that the sixty-third Psalm is especially appropriate for Mom's life right now. If you want to know how to pray for her, you can pray this Psalm. I sing my joy and praise. through troubled nights and days. in victory they will stand. Source: Psalter, 1912; Psalter Hymnal, 1987, rev.